Aristide Maillol was a catalytic figure in the Parisian art world before World War II. Many aspiring young artists found his work an antidote to the emotional extravagance of Auguste Rodin, then the most famous sculptor in France. 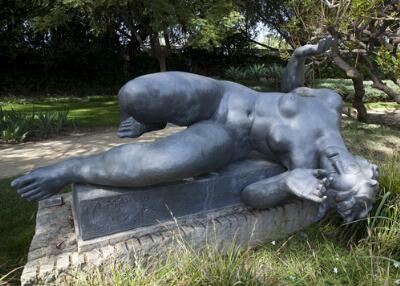 The female form, reduced to classical elements, was Maillol’s signature theme. Here, a trio of his monumental figures, created in the late 1930s, sets off the pond. This one is called River, a woman tumbling gracefully with the rhythms of flowing water. Across the pond is the large-limbed Mountain. She sits solidly on her base with the grandeur of the Alps. To the distant right, is Air, a figure that appears to float in a field of lavender. Each sculpture evokes the qualities of an element. Maillol concentrated his attention on the reinstatement of classicism in art, stripped of academic idealism and brought down to earth by the physicality of his robust models. He focused almost exclusively on the female figure, stating over and over again his conviction that sculptural form was surrounded by active, tangible space. Please take a moment to appreciate the beautiful overview of the Norton Simon Sculpture Garden from this point.